ProTone Pedals is now shipping the Jason Becker Perpetual Burn distortion pedal, which is based on Jason’s favourite Marshall JCM 800 amp, with a little inspiration from the JCM900 he used later in his career for good measure. It also features an additional clean boost channel at Jason’s request, after he said he enjoyed using a higher gain sound later in his career. CLICK HERE to buy the pedal right now. 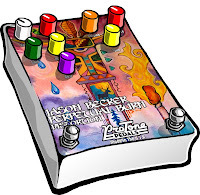 The pedal features original artwork by Jason’s dad, Gary Becker, and is handbuilt in Texas. In addition to being a solo artist, Jason was guitarist in Cacophony with Marty Friedman, and replaced Steve Vai in David Lee Roth’s band. His performing career was cut short when he was diagnosed with Amyotrophic Lateral Sclerosis, but Jason still composes music. Shrapnel Records will release The Best Of Jason Becker on November 4, including three new songs written by Jason which feature Marty Friedman, Greg Howe, Joe Satriani, Michael Lee Firkins, Steve Vai and Steve Hunter. Stay tuned for news of the Paradise Guitars USA Jason Becker limited edition guitar.